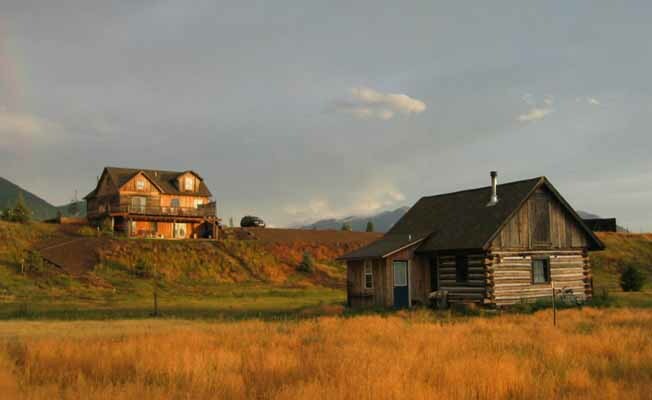 The Yellowstone House and separate historic Fisherman's Cabin are located on 16 acres of riverside meadows, nestled between the Yellowstone River and the towering Absaroka Mountains. Built recently, but using logs from an 1870's cabin, the house has a rustic feel but is outfitted with all the modern conveniences, so your comfort is ensured. Inside the Yellowstone House, a cathedral-ceiling great room, well-appointed kitchen, and designer furnishings are just some of the highlights. Specific amenities include: 4 bedrooms on 3 floors, each with a wrought iron queen bed 2.5 baths Multiple decks with stunning 360 degree views (ask about our bald eagle sighting guarantee!) High-speed Internet access TV/DVD/stereo Washer/dryer & dishwasher Fully-outfitted kitchen IMac computer 1914 Steinway Piano Additionally, the separate Fisherman's Cabin, located about 100 yards from the main home, offers: 1 loft bedroom 1 full bath Historic charm and privacy Fully-outfitted kitchen The property adjoins an undiscovered state-owned fishing access that offers one mile of direct river access just steps from the house. A short drive will take you to many of the region's most popular destinations: the charming town of Livingston is 15 minutes from the house, Bozeman and its airport are 45 minutes, and Bridger Bowl Ski Area is less than an hour's drive. The hot springs pool and highly-acclaimed dining room at Chico Hot Springs Lodge are just 10 miles from the house, and you can be in Yellowstone Park in a half an hour.